Inversion therapy or inversion exercises hang you upside down and are used to relieve lower back pain. Other potential benefits include improved circulation, improved posture and relief from exercises that compress the spine. If you're looking to try inversion exercises, choose from a variety of equipment. Purchase a new or used inversion table to practice in the comfort of your own home, or try out the devices at spas or gyms where therapists offer classes on their use. Regardless of your choice, start slowly to allow your body time to get used to the inverted position. Used to reduce back pain, inversion tables bring you gradually from a lying-down position to a vertical position. Thought to improve circulation and posture, the vertical position also takes pressure off your legs and back, helping decompress your spine from everyday stresses or activities such as jogging that compress the spine. People with herniated discs or degenerative spinal problems may benefit from inversion tables. Manufacturers produce both motorized and manual inversion tables in a wide range of prices. Inversion bars or racks are also available and are less expensive than an inversion table. Install the bars or racks in a standard door frame. Gravity boots attach your feet securely to an inversion table, inversion bar or inversion rack. Similar in appearance to ski boots, these specialized boots feature a hook that hangs from the bar or clips into the rack to provide additional support and ensure that you don't fall. While wearing gravity boots, you can perform abdominal exercises while hanging securely. A pair of rings such as those used by gymnasts opens up a range of possibilities for inverted exercises. 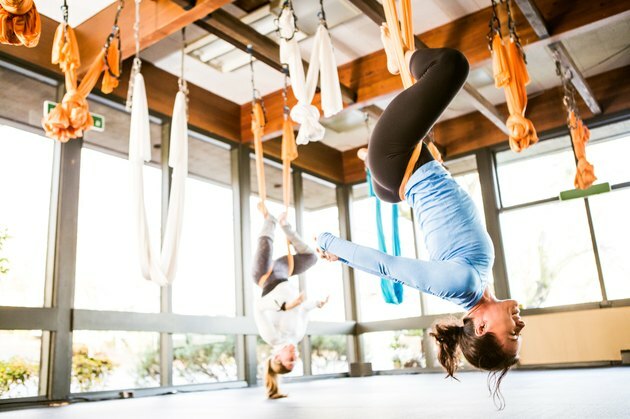 In the straight-body inverted hang, you simply hang upside down, head toward the floor and toes toward the ceiling. This helps improve your balance and exercises your stabilizing muscles. Other exercises -- such as inverted pullups and the handstand -- also bring you into an inverted position. During inverted pullups, point your body straight upward or bend at the hip, but keep your legs straight to bring your body into the piked position. If you suffer from heart disease, high blood pressure or eye disorders, inversion therapy could cause problems because it increases pressure on your eyes and circulatory system. Pregnant women should not use it. Some individuals report back pain or headaches after performing inversion exercises, and it may also strain your ligaments if you exercise too quickly or too frequently. Check with your health care provider before adding inversion exercises to your fitness routine or back pain therapy.